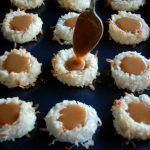 Delicious shortbread cookies, rolled in coconut, filled with sweet caramel, and a pinch of sea salt! COOKIES: Preheat oven to 350 degrees. Line 3 baking sheets with parchment paper. Pour coconut into a small mixing bowl; set aside. In a separate small bowl, whisk egg until well blended; set aside. Add butter, sugar and salt to the bowl of an electric stand mixer fitted with the paddle attachment. Beat on medium speed until well combined, scraping down the bowl occasionally. Pour in coconut extract. With mixer on low speed slowly add in flour and mix just until combined. Scoop out dough an even tablespoon at a time and shape into balls. Roll each dough ball in egg mixture then roll in coconut, gently pressing coconut onto cookies to help it stick better. Transfer cookies to prepared baking sheets spacing at least 1-1/2 inches apart. Make indentation in each cookie with your thumb or forefinger. Transfer baking sheet to freezer and chill for 10 minutes, or refrigerate 30 minutes. Transfer 1 baking sheet to oven and bake for 8-9 minutes. Remove from oven and re-indent cookies using the back of a rounded 1/2 teaspoon (at this point, if the coconut is browning too much your oven probably cooks too hot, simply tent the cookies with foil and proceed as directed). Return cookies to oven and continue to bake for an additional 8-9 minutes until the coconut is golden brown on edges and cookies have baked through. Cool on baking sheet for several minutes then transfer to a wire rack to cool completely. CARAMEL FILLING: Add caramels and cream to a small microwave safe bowl; heat mixture in the microwave for 30 second intervals, stirring well between intervals, until the caramel filling is melted and smooth. 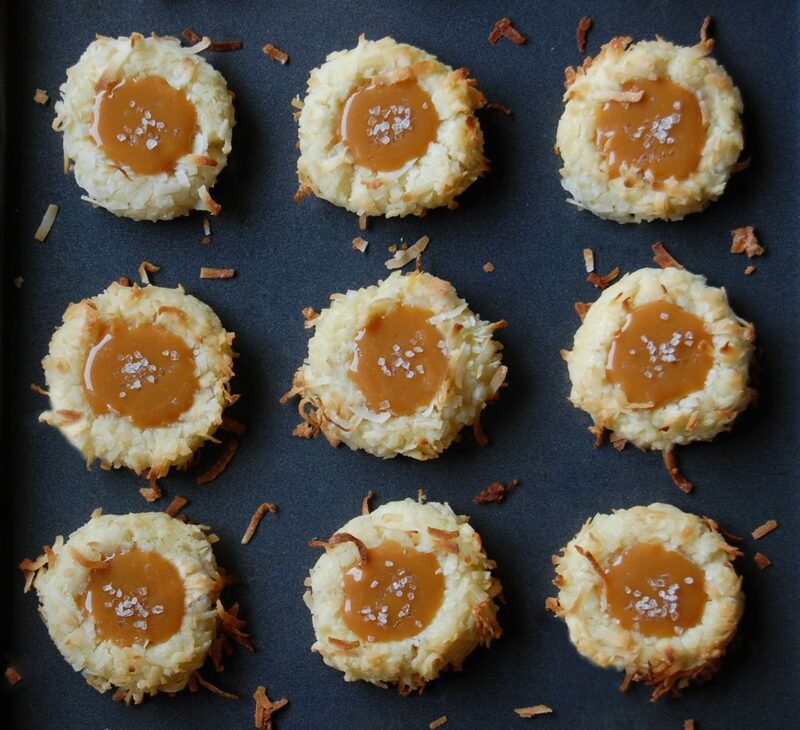 Cool caramel for a minute or two, then spoon caramel into the indentations in the cookies. Sprinkle caramel lightly with sea salt before it starts to set.